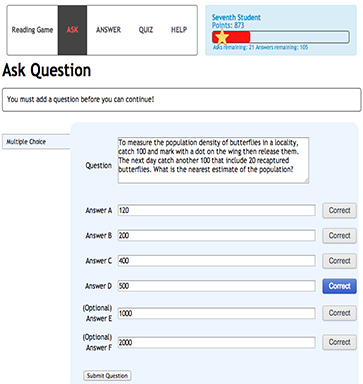 The Reading Game is a Moodle-based question and answer game designed to engage learners in the content of their coursework. Student participants (4 - 2000 players) create a collective learning space where every action serves to introduce, build or clarify concepts from the curriculum. The game has been successfully trialled in 12 courses, in a range of disciplines and modes of delivery, at Macquarie University over three years. It has proven effective for increasing student engagement in their course and lifted assessment performance across the whole class of students from 7% to 22%, in all delivery modes. The key to this level of engagement is that the Reading Game promotes active learning. This presentation, from both the tool designer and an academic who has been using it in teaching, will demonstrate how and why the Reading Game works so well. This seminar is aimed at Academics and Educational Developers who have requested further information from the developer before the game is added to UNSW Moodle's UAT instance, but is open to anyone with an interest in game-based learning or innovative use of technology for formative assessment. The presentation is for one hour, with an optional half-hour of additional discussion for those interested in continuing the conversation with the presenters. The Reading Game uses game design methods to engage students deeply by providing intellectual challenges (or “quests”) to pursue. The game challenges players to craft interesting questions on the course’s content that other learners can learn from and improve upon. The design includes a leader board, progress bar and a rating system to motivate students in a similar way to online games played purely for fun. In this case the inclusion of the game elements is part of a deliberate strategy to encourage students to connect with the course’s content and also achieve desirable learning outcomes. The Reading Game won the web-based games category in the 2nd Educational Games Competition held at the 8th European Conference on Games Based Learning (ECGBL), in conjunction with the 5th International Conference on Serious Game Development and Application (SGDA) in Berlin in October 2014, and was placed 2nd overall in the competition. The program was designed and developed by Robert Parker from the Macquarie University’s Learning and Teaching Centre (LTC), with Richard Kroon, an independent games developer.